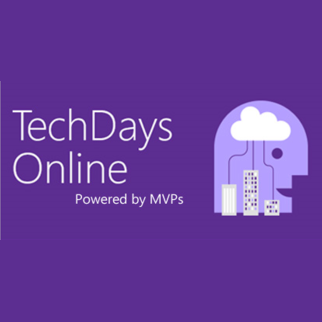 Our Office365 tenant is setup with ‘First Release’ which provides upcoming updates about two weeks prior to their formal rollout. Over the last month we’ve seen the Document Conversations feature coming and going. Hopefully it will be fully completed at some point very soon. 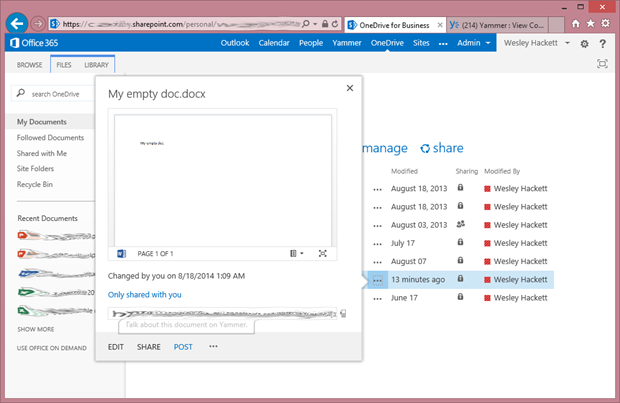 During this rollout I took the time to try out the feature and get a feel of how it works. Browsing to my OneDrive for Business page nothing different appears on the display. 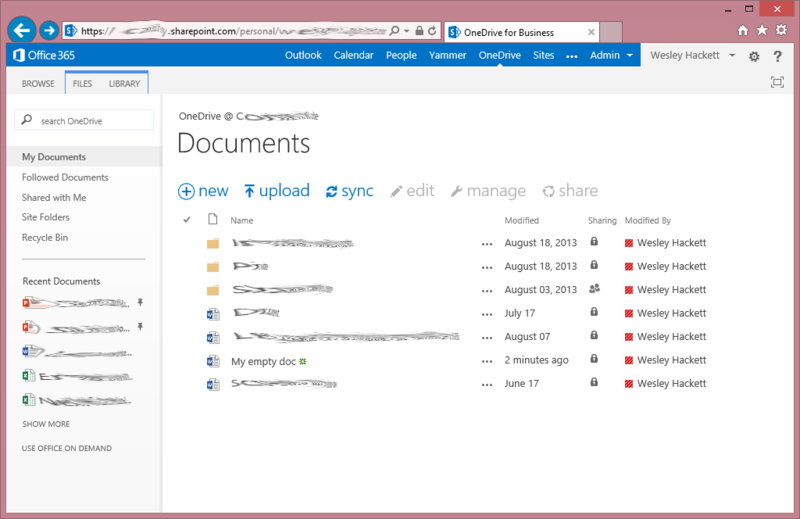 As you can see below it still looks the same as when the ‘Site Folders’ rolled out earlier this year. 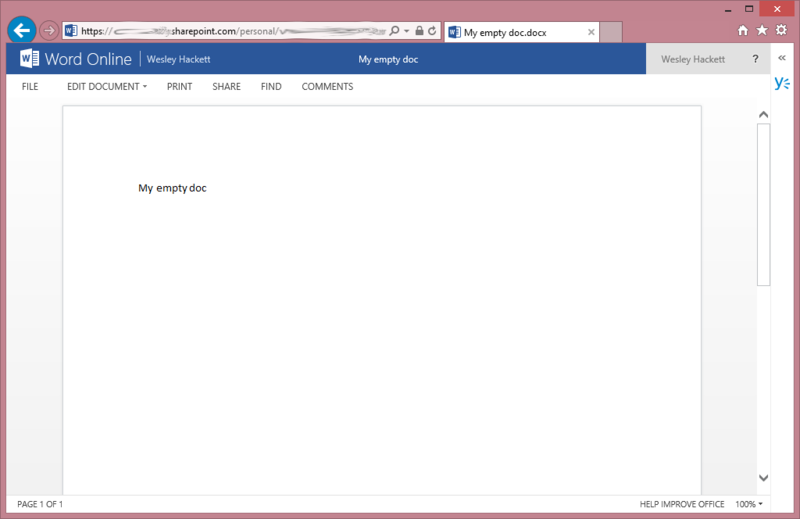 So to invoke the ‘Document conversation’ window you have to actually browse to the document. As you can see below a new right-hand slither has appeared with the Yammer logo and an indicator to click to expand. Clicking the Document Conversations bar expands it into the right-hand pane, much like the Apps for Office do in Office 365 Pro. On first use or when you’ve not signed into Yammer you will be prompted to sign in. The screen grab is once sign in has been done. 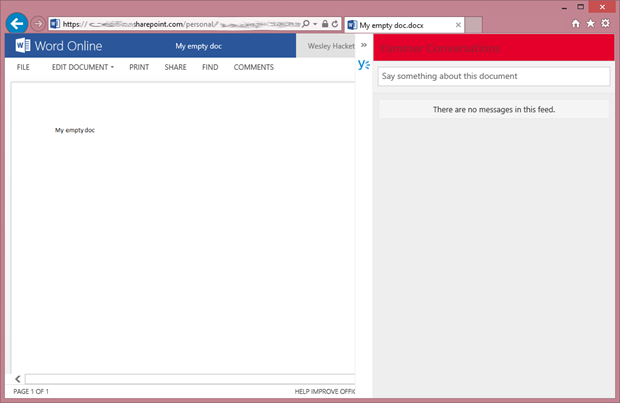 First thing to note here is it isn’t displaying any threads, that’s simply because I had newly created this document for the purpose of this article. Next lets create a new ‘Yam’ from the ‘Document Conversation’ pane. At this time it allows the user to select a group to post the ‘Yam’ into, interestingly there is no way to setup a default for this. I think it would be awesome if Microsoft had provided a ‘default group’ setting on the hosting Document library settings, as i suspect the feed is using the Yammer Embed which has the ability to set a default group. That way users could configure their defaults and avoid everyone posting into the ‘all company’ group. After posting the ‘Yam’ it can be seen in the ‘Document Conversation’ pane. 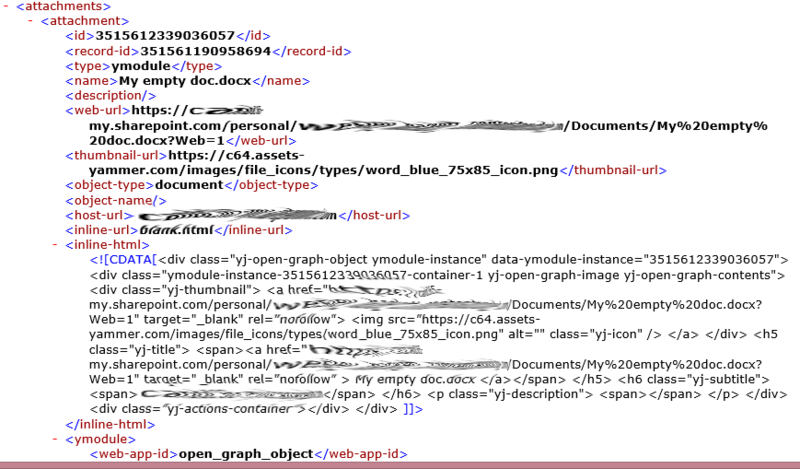 Note how its being presented as an OpenGraph object and not a url. Below is an example of a reply to the conversation thread. 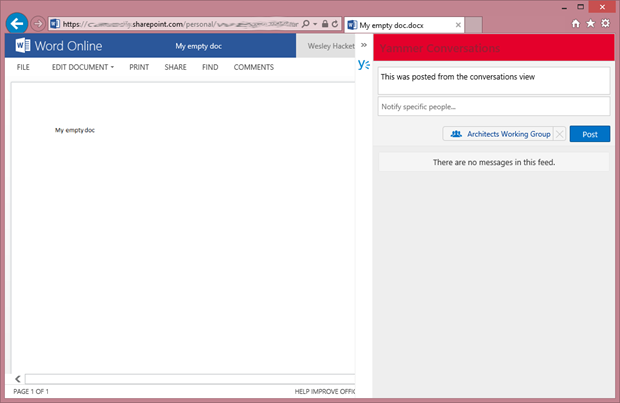 This is the same conversation thread within Yammer. Before the ‘Document Conversation’ feature was designed and built one of the first Yammer integrations with SharePoint was the ‘Post’ option which appeared on the document hover panels. The screenshot below shows the ‘Post’ option on the same file we just used for the ‘Document Conversation’ demo. 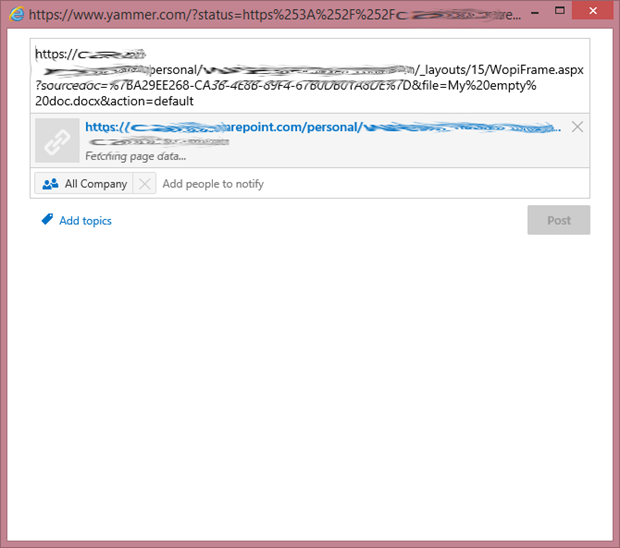 Clicking ‘Post’ launches a modal window with a url in the message body so you can type a ‘Yam’. As you can see from the screenshot this is a pretty basic UI. 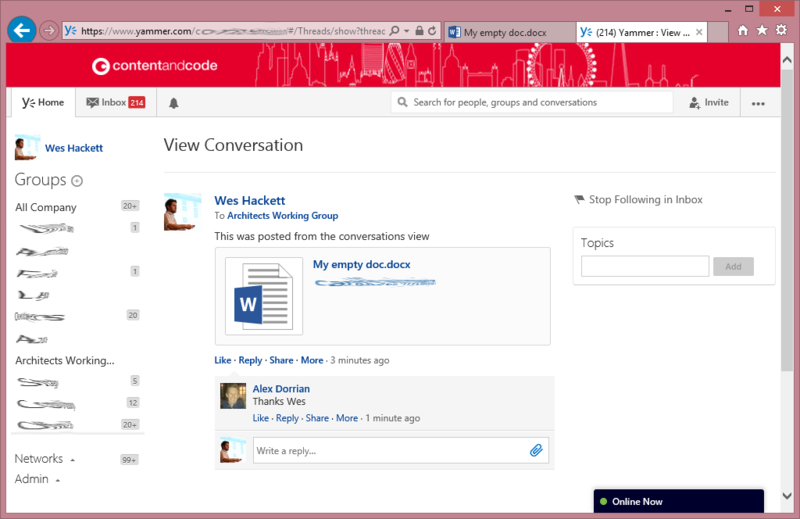 The screenshot below is the ‘Post’ in the yammer group. So we’ve seen how both approaches seem to work. 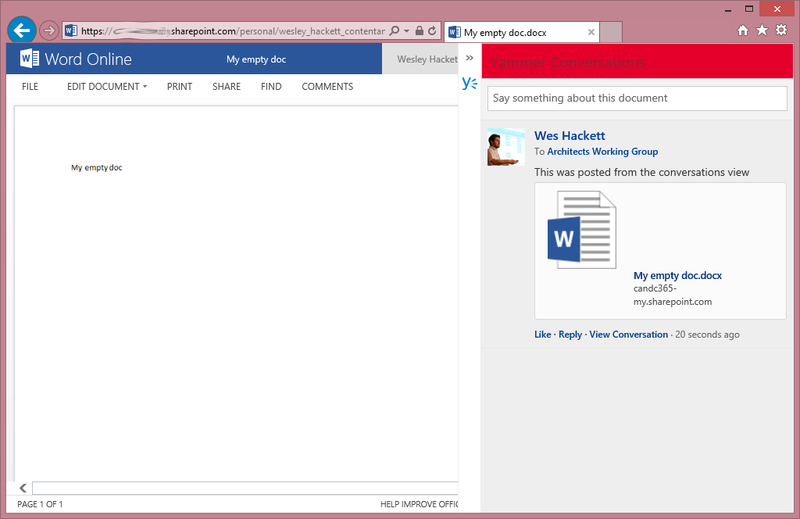 The one thing that i found puzzling was in the Yammer group i’d seen two threads about the same document. 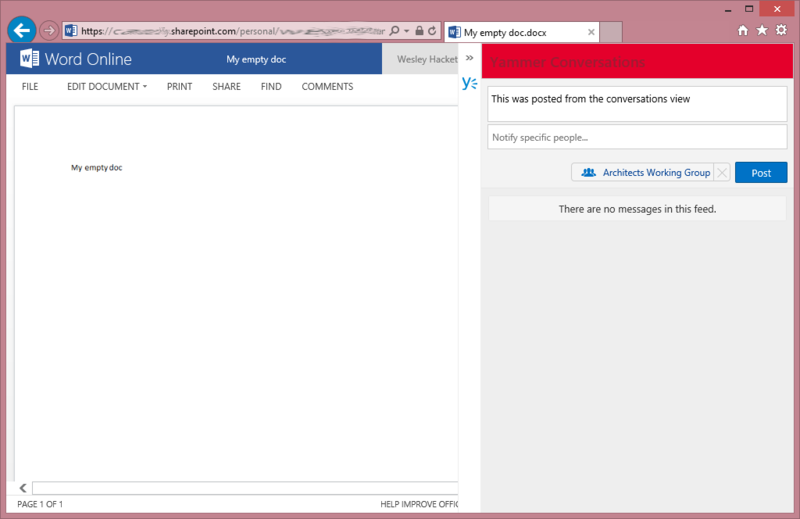 One from the ‘Document Conversation’ pane and one from the ‘Post’ modal dialog. This didn’t make sense on first glance I would have expected both to reference the same item (url) as the OpenGraph object. 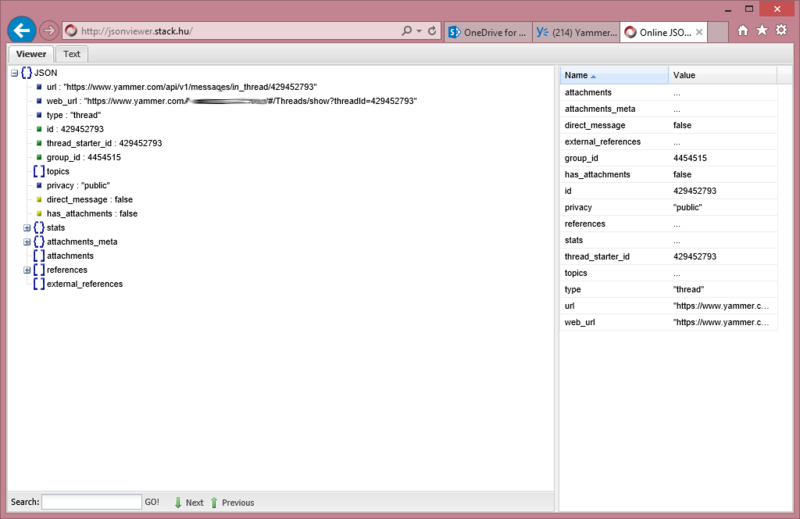 The ‘Document conversation’ thread has the following JSON returned from the API. 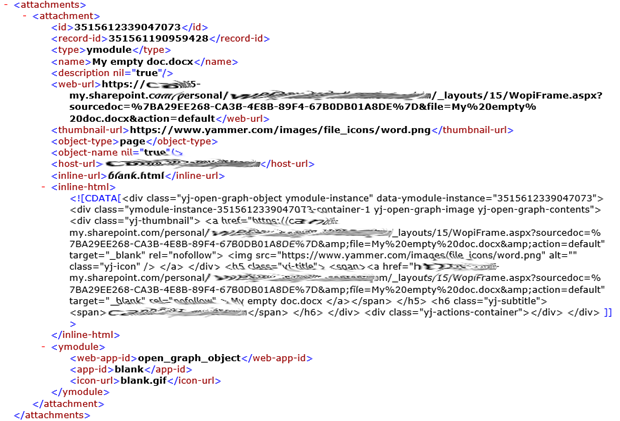 The body of the ‘Yam’ contained a url of the file path with query string ?web=1 which when launched opens the document in the Office Online app. The OpenGraph object is detailed below. Again not the url has the ?web=1 querystring. The ‘Post’ thread has the following JSON returned from the API. We can see nothing special in the thread itself. The content returned by the ‘Yam’ this time shows the WOPI (Office Online) url has been used. 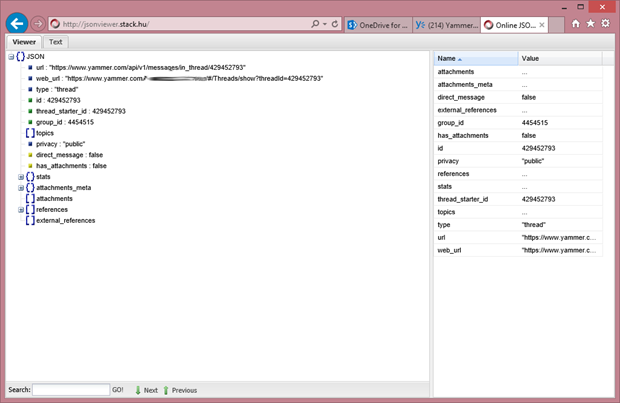 The view of the attachments xml confirms the information. Via ‘Post’ creates a brand new post. The ‘Post’ feature adds a brand new OpenGraph object and thus starts a new thread, rather than finding the existing thread and presenting it back to the user in the popup window. 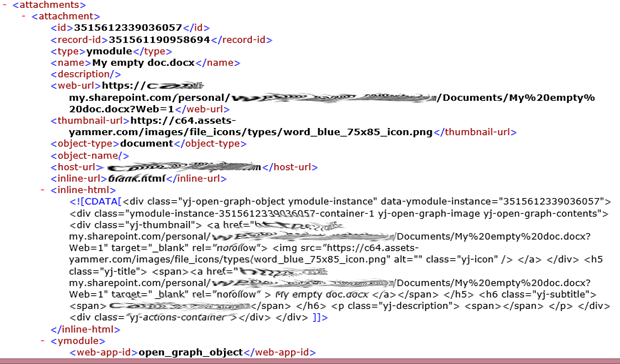 So the two methods use different urls thus become two different OpenGraph objects. 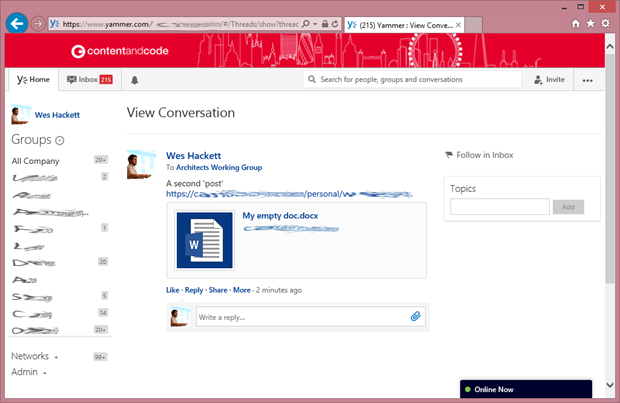 It would be great if Microsoft could bring them into alignment so that there is one solution url so all conversations appear in the same thread.